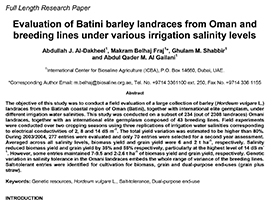 The objective of this study was to conduct a field evaluation of a large collection of barley (Hordeum vulgare L.) landraces from the Batinah coastal region of Oman (Batini), together with international elite germplasm, under different irrigation water salinities. This study was conducted on a subset of 234 (out of 2308 landraces) Omani landraces, together with an international elite germplasm composed of 43 breeding lines. Field experiments were conducted over two cropping seasons using three replications of irrigation water salinities corresponding to electrical conductivities of 2, 8 and 14 dS m-1. The total yield variation was estimated to be higher than 80%. During 2003/2004, 277 entries were evaluated and only 70 entries were selected for a second year assessment. Averaged across all salinity levels, biomass yield and grain yield were 6 and 2 t ha-1, respectively. Salinity reduced biomass yield and grain yield by 35% and 55% respectively, particularly at the highest level of 14 dS m-1. However, some entries maintained 7-9.5 and 2-2.6 t ha-1 of biomass yield and grain yield, respectively. Genetic variation in salinity tolerance in the Omani landraces embeds the whole range of variance of the breeding lines. Salt-tolerant entries were identified for cultivation for biomass, grain and dual-purpose end-uses (grain plus straw).